GBP/USD kicks off the week slightly lower as Brexit uncertainty looms. The technical picture is decidedly mixed for the pair. GBP/USD is slipping off the 1.3200 level after recovering on Friday. Brexit remains left, right, and center, but also concerns about the global economy weigh. After the EU Summit resulted in a delay of Brexit at least until April 12th, UK PM Theresa May is scrambling to muster support for her deal, as usual. The British media reports that May has offered to resign in return for support. Others say this is a condition laid out by her opponents, and other stories suggest there is an attempt to oust her and nominate an “interim PM” such as her deputy, David Lidington. The meets in the morning and news from that meeting may impact the pound. Parliament will later try to take control. Several MPs from all parties will attempt to reserve Wednesday as a day of debate for alternative Brexit options. The initiative led by Oliver Letwin, Yvette Cooper, and others, will allow lawmakers a series of “indicative votes” on the path forward. One of the options is going for a softer Brexit, perhaps by adopting the Norwegian Model. Norway is not a member of the EU but pays into the EU budget, allows free movement and enjoys the full benefits of both the Single Market and the Customs Union. A second-referendum is another option. Around one million people took to the streets of London on Saturday, demanding a fresh vote. Also, a petition calling to revoke Article 50 has surpassed five million signatures, obliging the House of Commons to consider a debate. The vote on whether Parliament will hold indicative votes on Wednesday is due around 22:00 GMT. Statements, news reports, leaks, and rumors are set to move the pound. Following the Fed’s second dovish twist last week and the apparent downturn in Germany, markets fear a worse global slowdown. The US 10-year to 3-month bond yield spread turned negative, signaling a recession in the world’s largest economy. Markets closed lower on Friday, and the slump extends to today. The risk-off mood favors the US Dollar and the Japanese Yen over other currencies. FOMC member Charles Evans said inflation remains low and there is no need to raise rates. He also opened the door to cutting rates. GBP/USD is suffering from a bit of downside Momentum on the four-hour chart, but the Relative Strength Index is fairly balanced around 50. And while the pair trades below the 50 Simple Moving Average, it is well above the 200 SMA. All in all, the technical picture is mixed. 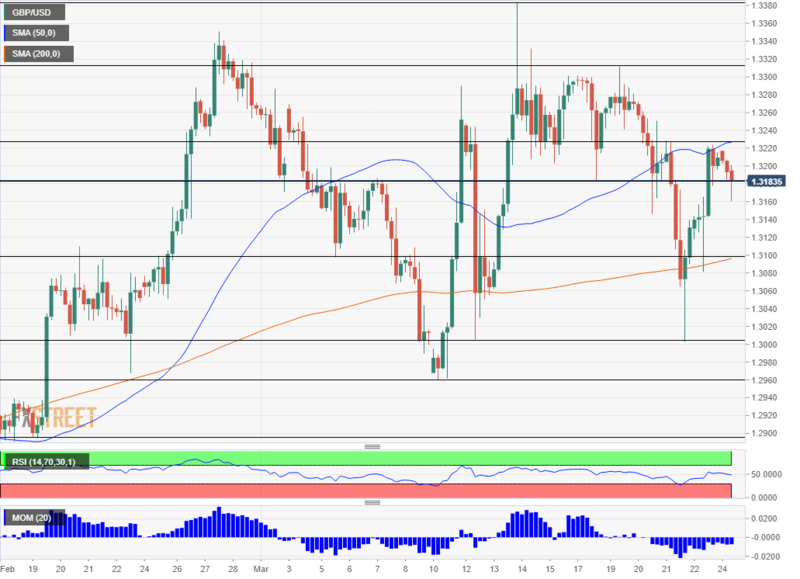 Support awaits at 1.3100 which is where the 200 SMA meets the chart. The round number was a support line in early March. Further down, 1.3005 was the low point last week and also provided support earlier in the month. 1.2960 is another double-bottom, followed by 1.2895 which cushioned the pair in mid-February. Looking up, 1.3225 was a high point early in the day, and it is also where the 50 SMA meets the chart. Far above, 1.3315 was a swing high last week and 1.3388 is the cycle high. Volatility is set to remain high.